One of the most exciting things about being part of the tattoo community is how many cool projects there are to get involved with. More than any other art scene, tattooists tend to be very comfortable working together on collaborations, performances and other art projects, allowing them to explore a wider range of techniques and styles than an artist would just working by themselves. Over the past decade we have been involved in a number of such projects, all of them very different from each other but each exploring a different aspect of vision, creativity and collaborative energy. 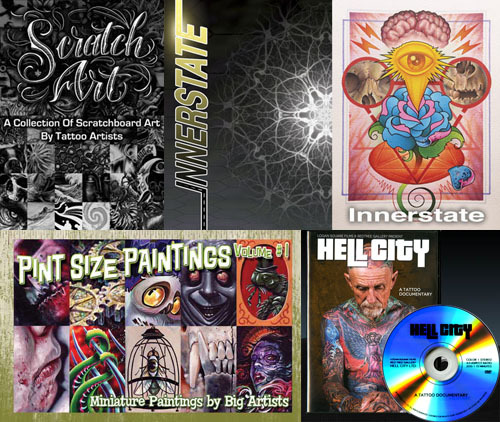 In The Tattoo Community Project Pack, we feature books and DVDs from four of these projects: Hell City: The Movie, Scratch Art, Innerstate and Pint Size Paintings. Hell City: The Movie Many of you probably know Durb Morrison because of his spectacular Hell City Tattoo Fest, which is held twice every year in Columbus, OH and Phoenix, AZ. Hell City has long been one of America's most stand-out conventions. It's packed with all kinds of events and features, but its foundation has always been built on the high skill level of the artists who work at the show- Durb personally screens the portfolios of all artists applying to work there. After 7 years of filming, Durb's friend Russell Dornhecker has released a documentary about the Hell City Tattoo Fest. It's a visual feast featuring the tattoo artists, collectors, performers, painters, showmen and downright characters that populate the Hell City Fest. Whether you've had a chance to attend the festival or not, you'll be entertained by this powerhouse film. The Scratch Art project is the brainchild of Hyperspace Studios' Michele Wortman, who noticed that the scratchboard medium had many interesting parallels to tattooing and wondered what would happen if a large group of tattooists had a chance to try it out. The result is a fantastic collection of different imagery, styles and techniques, all done in the scratchboard medium. This 272 page book is absolutely chock full of surprising, innovative imagery from hundreds of tattooists, including some of the industry's biggest names. Innerstate was a 5 day gathering of 40 tattooists held in conjunction with the 2009 Hell City Tattoo Fest. The artists invited worked in many different styles, but all had one thing in common: Every one of them is not only an experienced tattooist but also a dedicated practitioner of some other artistic medium outside of skin art. After warming up for 2 days in private, the group completed their projects in a live public performance setting, all in the face of time and crowd pressure. It was very much in a similar spirit to the ArtFusion Experiment, but with a key difference: artists were encouraged to plan their projects ahead and spend the weekend bringing it to completion, as opposed to the ArtFusion goal, which was to mix and match different artists' visions in a random blend. After the Innerstate event, we produced a 100 page full-color book highlighting the event and featuring color plates of all the finished pieces in this surprising body of artwork; in addition, Guy Aitchison produced a 50 minute documentary about the experience. Pint Size Paintings is the invention of Hell City's Durb Morrison, who began experimenting with very small paintings and decided to ask the entire community to submit work for the project. All pieces are 2x3 inches, but the similarity ends there; as with the Scratch Art book, every variety of vision is represented here in vivid colorful detail. And like Scratch Art, it is a small book that you will find yourself flipping through again and again, and finding surprises each time. This collection of 3 books and 2 DVDs would normally retail for a total of $145, and if you already have any of these items, they are all available separately. However, we are now offering a special bundle price for the whole collection- only $130 for everything. Fatten up your tattoo library today with these essential inspirational items. Makes for a great gift too!